As a mom of a little girl, I just love hair bows and headbands! Big, little, every day or special occasion, I can't get enough! I was recently offered the opportunity to review Apple Beary Bowtique and after a glance at their beautiful headbands, I was in love! Each headband was truly breathtaking in it's very own way. From the lovely hand-rolled rosettes in a variety of shades and hues, to the delicate yet bold accessories, you can easily see how these headbands are unique and made with love. "Welcome to Apple Beary Bowtique where every bow is unique. Beautiful and unique bow suitable from newborn, toddler and girl. Great for photo prop and great addition to your loved one's wardrobe." Angeline at Apple Beary Bowtique, offered me a choice of any headband in their Handmade Rolled Rosette Headband album on their page. I knew that I had my daughter's 1 year photos were scheduled in a little over a week, and I wanted something that would fit perfectly with the outfit I had planned. I can honestly say I spent a good bit of time pouring over the photos of their headbands, each one with it's beautiful silk rosettes and detailed accessories. Finally, I decided on the Fall Falliage Headband. Since my daughter's main outfit would be pink, I wanted something that had this shade, but also complimentary colored rosettes. After finalizing my decision, I just told Angeline my daughter's age and she made the headband to size. When the headband arrived I couldn't wait to open the package and it was absolutely gorgeous! The rosettes were so shiny, delicate looking and perfectly balanced with the rhinestone accessory and feather. I wanted to immediately put in on my little girl's head, but she was busy eating dinner and I was not going to let it get covered in sweet potatoes! So, I patiently waited until her photo session the next day. And I think it was well worth it! It fit perfectly! I have come across so many too tight or poorly made headbands, but the headband portion was so soft, yet stretchy enough that I know I will be able to use it in the future! And most importantly...she loved it! 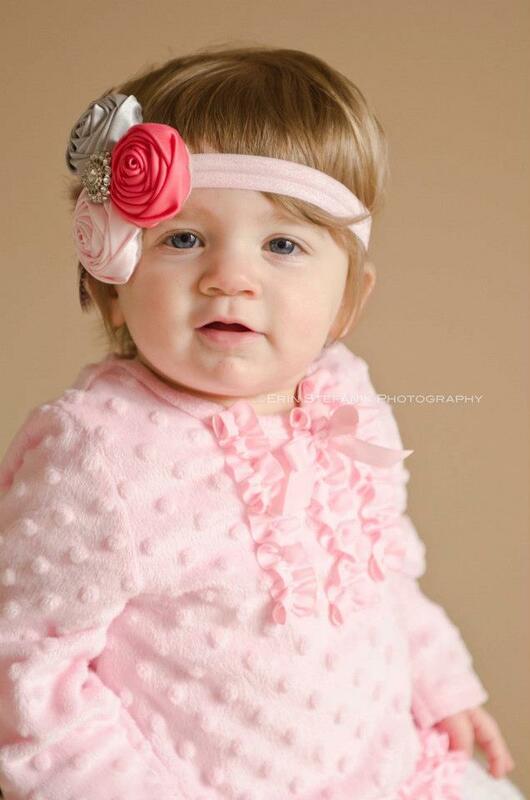 Since our photo shoot, every time she sees the headband she signals at it and "asks" for it in her 1 year old way! I just can't resist and I know she loves it! She loves taking it off to look at it and then putting it back on and strutting all around the house in it! We might have a little diva on our hands! Overall, the headband was even better than expected and I wish I had come across these sooner! It is well-made, comfortable, eye appealing, and I can't wait to pair it with so many different outfits! Are you ready for the most exciting part?! 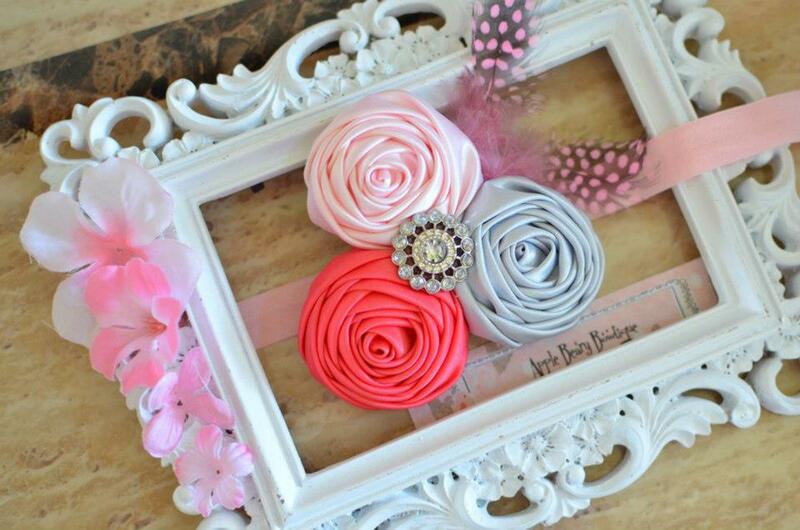 Angeline at Apple Beary Bowtique has been kind enough to offer a giveaway prize of the winner's choice of one of the headbands from her Handmade Rolled Rosette Headband album! That's right, one of my lucky blog reader's will win their very own beautiful handmade headband! After you enter, I highly recommend you visit the Apple Beary Bowtique Facebook page and browse their selection of bows and headbands. There are a number of them that would be perfect for the holidays and all year-round! This is for my cousin who'll be expecting her first girl in April!